RIO DE JANEIRO, BRAZIL – The administration of former President Luiz Inácio Lula da Silva launched its Growth Acceleration Program (Programa de Aceleração do Cresimento, PAC) in 2007 as an attempt to increase economic prosperity. 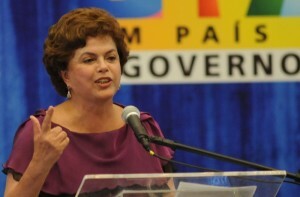 Dilma Rousseff as former Minister of Casa Civil, at the launching of PAC2 in Brasília, in 2010, photo by ABr. Among its objectives were long-awaited developmental projects to provide housing, improvements in sanitation, lighting, and transportation, including a high-speed rail to connect São Paulo and Rio de Janeiro, to cities throughout Brazil. Although PAC may have been strategically timed in preparation for the hosting of the 2014 World Cup and 2016 Olympic Games, certainly the goals are far reaching and altruistic. 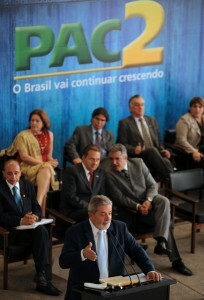 The first PAC had a budget of R$504 billion for projects that were to be conducted between 2007 and 2010. The PAC 2 would cover from 2011 and 2014 and sought to continue and expand the programs started during the PAC. However, the progress of the first PAC was all but impressive. Contas Abertas, a non-governmental organization that monitors the transparency of governmental programs, demonstrated in an April 2010 housing report that of the 4,146 total development projects nationwide, only 227 had been completed – achieving only over five percent of the program’s total goals. Former President Lula at the launching of PAC2, photo by ABr. In the state of Rio de Janeiro, the number was much lower. Of 237 total housing projects, only two had been completed – less than one percent. In 2009, Brazil’s federal government accountability office (Tribunal de Contas da União, or TCU) evaluated a Fiscobras report that outlined “irregularities” in various government projects. Of the 99 PAC projects evaluated in the report, thirteen were recommended to be shut-down, including an oil refinery project in Recife, the expansion of São Paulo’s Guarulhos airport, an energy distribution project in Piauí, and a subway line in Niterói, according to O Globo. The slow start to the PAC projects is reminiscent of projects that were undertaken by the government of former President Juscelino Kubitschek during the 1950s and 1960s. Kubitschek came to power in 1956, promising “fifty years growth in five.” His “Plano de Metas”, or Goals Plan, included investments in dam and road construction, basic industry, education, health, agriculture, communications, and the doubling of oil and electric production through Petrobras and Eletrobras. While this period has its critics, it was the time when Brasília was constructed and established as the nation’s capital, a massive accomplishment. If history is to repeat itself, the government’s willingness to invest will need to be accompanied by an ability to efficiently plan and execute its projects. PAC is for the English to see. The first PAC houses in Rio (Manguinhos) where to be handed over to the new “proud” owners in April 2010. They are close to the train line between the Triagem and Manguinhos station. It was to be a ceremony with Lula, Cabral and Paes handing over the keys. The ceremony was canceled as the apartments on the first floor where flooded with at least 1 meter of water.